Darren Boyce wheels away in celebration after his second minute header ends up in the Coleraine net during today's game at Ballycastle Road. Picture: Press Eye. 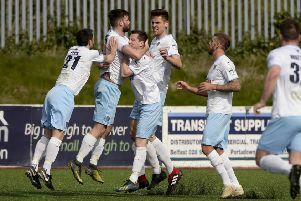 Ballymena United beat Coleraine for the third time in four meetings to keep alive hopes of finishing in seventh position in the Danske Bank Premiership. Darren Boyce’s second minute header was enough to settle a low-key ‘derby’ tussle at Ballycastle Road - a result which takes United to within a point of their rivals in the league table. Manager Glenn Ferguson enjoyed the rare luxury of naming an unchanged line-up from the side which won at Ballinamallard last week. And the visitors made the perfect start with a goal inside two minutes as Darren Boyce rose unchallenged to head home from Neal Gawley’s corner. Coleraine had a chance to level on seven minutes when Ian Parkhill latched on to Johnny Taylor’s weak headed back=pass but his shot was smothered by Tim Allen. The big Australian keeper was called into action again on 21 minutes when striker Jamie McGonigle - who looked several yards offside - ran on to a through ball but as he went to go round the keeper, Allen stuck out a hand to divert the striker wide ans the chance was lost. Brad Lyons headed over from close range from a Ruaidhri Higgins corner, while John Watt drilled a low shot just wide as Coleraine made a positive response to their early setback. Little was seen of Ballymena as an attacking force in the opening half hour but they did carve out an opening with a neat move down the right flank which ended with Gawley’s low cut-back being scooped over by the in-rushing Thompson on the edge of the area. Coleraine thought they had equalised two minutes before the break when Ian Parkhill produced a neat finish from Brad Lyons’ through ball but the celebrations were cut short by the raised flag of the assistant referee. The second half failed dismally to ignite with a series of half chances as both teams struggled to get to grips with the difficult surface. Neil McCafferty curled a free kick straight at Allen while at the other end, Gawley cut inside onto his left foot and his 20-yard shot was turned behind by Findlay. In fact the biggest cheer of the second half was resevred for Allen who came out of his goals to dispossess COleraine sub Ruairi Harkin with a perfectly-timed tackle in the left-back area. United missed a golden opportunity to clinch victory with five minutes left when substitutes Matthew Tipton and Matthew Shevlin combined to leave the latter clear on goal but Findlay came off his line quickly to block Shevlin’s effort with his legs. Coleraine: Findlay, Watt, McNeill, Canning, Ogilby, Lyons, McCafferty, Higgins, McCauley, Parkhill, McGonigle (sub Browne 56). Subs: McGinty, Stewart, Mullan, Harkin. Ballymena United: Allen, Ervin, Kane, Taylor, McBride, Gawley, Thompson, Surgenor (sub Jenkins 59), Teggart, Cushley (sub Tipton 60), Boyce (sub Shevlin 75). Subs (not used): Ruddy, McAllister.